Al Hartmann | The Salt Lake Tribune Steve Kaufusi coaches BYU's 2016 defensive line during practice Tuesday Aug 23. Provo • BYU football coach Kalani Sitake continues to shuffle his coaching staff after last year’s disappointing 4-9 record left the Cougars out of a bowl game for the first time since 2004. 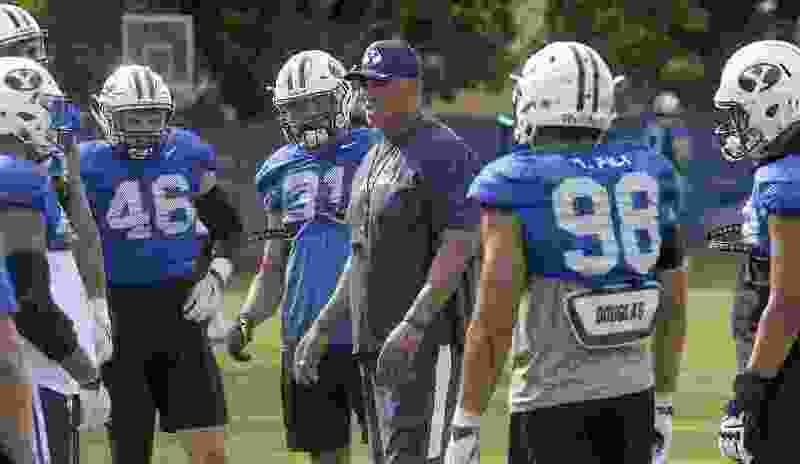 Sitake announced Friday that longtime defensive coach Steve Kaufusi is stepping down “to pursue other interests” and will be replaced by Weber State assistant Preston Hadley on the defensive staff. Kaufusi was at BYU for 16 years and most recently coached the linebackers. Hadley, a former BYU defensive back, will coach the safeties. BYU still has an open position for a 10th assistant coach. It will hire an additional offensive coach to complete its staff for the 2018 season, according to a school news release. Hadley’s addition means that assistant head coach Ed Lamb will move from safeties coach to linebackers coach. Lamb is also the special teams coordinator. Defensive coordinator Ilaisa Tuiaki and cornerbacks coach Jernaro Gilford will maintain their current responsibilities. Sitake will “also assist in coaching the defense in 2018,” according to the release. BYU’s finished its worst season since 2004 ranked 51st in total defense, giving up 372.8 yards per game. Its biggest problem last season was offense, a situation Sitake hopes he remedied by releasing offensive coordinator Ty Detmer, receivers coach Ben Cahoon, running backs coach Reno Mahe and offensive line coach Mike Empey and replacing them with Jeff Grimes, Fesi Sitake, Aaron Roderick and Ryan Pugh. A former BYU player, Kaufusi started his 24-year coaching career as a graduate assistant at Utah in 1994. He played three seasons in the NFL for the Philadelphia Eagles. His wife, Michelle, was sworn in as Provo’s first female mayor earlier this week. Corbin Kaufusi is entering his senior season as a defensive end and Devin Kaufusi joins the team this spring after having recently returned from an LDS Church mission. Hadley played high school football at Pleasant Grove before earning all-conference honors at Snow College. He started all 26 games at cornerback for BYU in 2011 and 2012 and made 117 tackles, 21 pass breakups and 2.5 sacks in two seasons. He was a member of the 2012 BYU defense that finished the season ranked No. 3 in the country at 266.1 yards allowed per game. Hadley earned a master’s degree in coaching and athletic administration from Concordia University Irvine in 2016. He has been at Weber State the past two seasons and helped the Wildcats win the Big Sky Conference title and a school-record 11 games in 2017. “I am very thankful to [Weber State] coach Jay Hill for teaching me how to be a football coach, and to Coach Sitake, Coach Tuiaki, and the BYU administration for the opportunity to serve at my alma mater and help provide the BYU experience to the student-athletes,” Hadley said. Donovan Mitchell knows there’s another level he needs to get to. He’s going to spend the offseason preparing to make that jump.